For those of you who may be heading to Singapore on a short stopover or holiday, you may be interested in experiencing Singapore through 'feng shui eyes'. The ancient art of feng shui is widely accepted, talked about and practised here, so it was with great anticipation that I visited some of the most famous buildings in Singapore. Along with Hong Kong, Singapore has the reputation of being feng shui city. Mind you, it took great strength and will power to pull myself away from the air-conditioned comfort of the underground and street level shopping centres located EVERYWHERE in Singapore. Because of the size, shape and prime feng shui location of this Resort, Singaporeans question whether it will be good for Singapore or bring the country bad luck. Las Vegas Sands won the bid to build this massive complex. The intial estimate of S$3.85 million, plus the cost of the 6,000,000 sq ft land site (S$1.2 billion), blew out to over S$8 billion by the time if officially opened in June 2010. To date, the complex is still not finished and work will continue into 2011. The three tall towers contain the Hotel and the platform on top is called the Skypark. This is where the amazing swimming pool overlooks Marina Bay. Three curved buildings in front of the towers contain the Casino and the shopping centre. The open lotus shaped building is the Art Science Museum. Sitting at the 'Dragon's Mouth' of Singapore, this complex sits in a wonderful position to soak up all the positive qi and prosperity before it disperses into the South China Sea. Instead of facing out to sea, the Resort looks over Marina Bay, the financial district which includes all the major banks, Boat Quay and Clarke Quay to infinity. According to one of my feng shui teachers Grand Master Raymond Lo, the location and the direction the Hotel faces represents 'the Dragon turning back to greet the Ancestors'. This is considered very auspicious! In the 1800's, the old Port of Singapore (now Boat Quay and Clarke Quay) was the location of most of the island's trade and economic activity. Boat Quay, which is situated on the southern bank of Singapore River, was once crowded with shophouses because this part of the river resembles the belly of a carp, where wealth and prosperity lay. By creating a large towering mountain style building, Marina Bay Sands Hotel has created an artificial Dragon's Head which turns back to look at Singapore City - the ancestors. For this reason, most feng shui experts believe this Hotel will be very good for Singapore. Because the Hotel forms a kind of artificial table top mountain, it is believed the complex will also prevent some of Singapore's prosperous energy from being scattered into the South China Sea. To analyse the energetic interplay of a pool or body of water sitting on top of a building, Feng Shui Masters turn to the I Ching and the meaning of the hexagrams. Hexagram 39 'water over mountain' (a building is considered a mountain), and hexagram 31 'lake over mountain' are the two hexagram combinations which have been analysed. 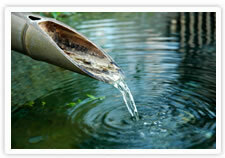 Close observation of the nature of the pool is necessary to determine which hexagram is correct. Having visited the SkyPark, I noticed that the pool only covers about a quarter of the top floor so it is only a small body of water in relation to the size of the 57th Floor. Visit Sands SkyPark photos which give you a good idea of the total area of the top floor. Also, if you look at the photo below, you will see that the water running from the pool directly feeds back into the pool and does not run over the sides of the outer building wall as it does in some island resorts. In the 'Book of Changes and the Unchanging Truth' by Hua Ching Ni (page 381), he states ...'and the Lake is contained by the Mountain'. 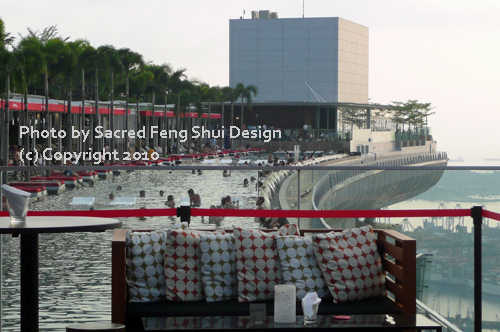 So what is the prediction for the Skypark Infinity Pool from the I Ching? Mutual Attraction! "In this hexagram Lake is above Mountain. This image represents the mutual attraction and interaction of these two kinds of natural energy. While each retains its own natural characteristics, together they interact and harmonise." (Book of Changes and the Unchanging Truth, Hua Ching Ni, p.380). More specifically (p. 384) "a trade or business venture can be successful". The shape of the SkyPark is often referred to as a blade, but if you look at the photo below, you will notice it curves inward so as not to offend or disturb the energy of the financial district, businesses and city across the river. If the curve or bend faced outwards and towards the city, it would be considered sha qi or negative energy was being directed towards Singapore City. So the Sands Skypark design symbolises respect, harmony and friendship with Singapore (the ancestors). I took this photo from Ku De' Ta, the bar located on the 57th floor. Definitely a must see! The bar opens at 6pm, strict dress standards apply. A cover charge applies from 9pm. If you would like to see my amateur video of the view of Singapore from Ku De' Ta, click on the photo, or this link which will take you to my You Tube site. Common to all resorts with Casinos throughout Asia, water features and fountains dominate the decor, and Marina Bay Sands Resort is no exception. There are moving water troughs in the Shopping Centre, and the Hotel has lots of water features in different designs, all are beautiful and quiet. Top marks go to the Architect Moshie Safdie and feng shui Master Chong Swan Lek. Master Chong Swan Lek, who also consulted on Sentosa Island Resorts World, worked on the Marina Bay Sands Resort until his untimely death of lung cancer in 2008 (before the project was finished). Mrs Louisa Ong Lee took over from her Master. In an article I read in the Straits Times, Mrs Ong-Lee said 'the three towers represent three mountains or warriors guarding the gateway to Singapore. The SkyPark is like a scholar's hat, symbolising new skills being acquired, while the three domes in front symbolise three coins which stand for prosperity. The lotus shaped Art Science Museum is designed like an open palm, a gesture of giving and welcoming.' 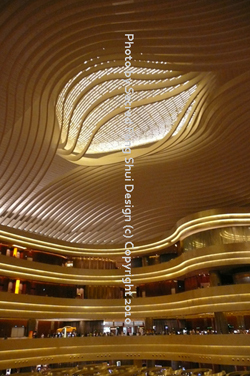 I particularly love the golden eye light on the Casino ceiling (see photo below). The only 'out of character' design element is the rainbow coloured murals at the Hotel check-in. See what you think when you visit the Resort! Originally, I was going to discuss the unique Flying Star Chart of this complex, but the Marina Bay Sands Resort analysis would turn into a mini book and end up being too technical for the general public. Some shopping, wining & dining tips at Marina Bay Sands Resort! Of course I cannot end my feng shui story on this wonderful Resort without a few shopping tips. Don't miss the 'diamonds are a girls best friend' jewellery stores located in the shopping arcade near the entrance to the Casino. You will see jewellery that you would expect to see on movie stars, absolutely amazing! As you may need a pick me up after viewing these treasures, go to SweetSpot in the Hotel's atrium. They make the best coffee in Singapore (particularly cappuccinos) and yummy muffins and cakes. At 6pm, join the Ku De' Ta cue for a cocktail on the 57th floor. The Restaurant is booked out three weeks in advance. If you are visiting from overseas, don't forget to take your passport when you go to the Resort! You will need it to get into the Casino for free, otherwise you will have to pay S$100. You see the Singapore Government devised this 'tax' to discourage the locals from gambling. So every 24hrs Singaporeans get charged S$100 for gambling at the Casino. Foreigners can gamble for free. Built in 1928, the original tenants were the General Post Office, Chamber of Commerce and the Singapore Club. 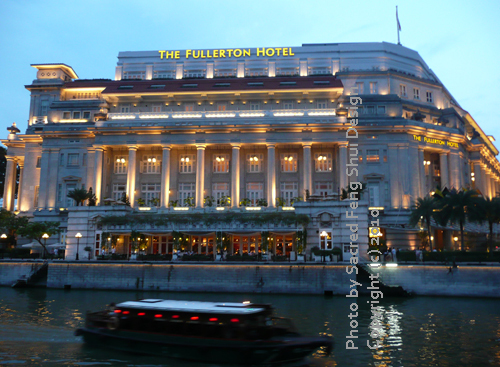 Once upon a time, the Fullerton Hotel protected the harbour. On its rooftop stood the lighthouse, whose beacon safely guided ships into the harbour. The restoration and conversion of this beautiful old building into a 400 room luxury hotel cost over $300 million. During the building's redevelopment from 1998 to 2000, great care was taken to retain and restore its architectural features, both inside and out. However, in striking contrast to the neo-classical architecture of the building, a modern and large feng shui fountain surrounded by a metal frame sits at the top of a grand staircase. 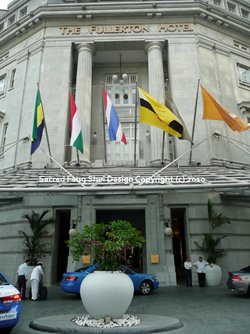 Grand Master Tan Khoon Yong was consulted on the feng shui of the Fullerton Hotel. As a qualified feng shui consultant, one of the first areas I look at when ascertaining the feng shui of a site is the shape of the buildings that surround my client's home, office or shop. 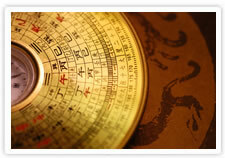 This method of feng shui analysis is called Form School. Tall buildings such as the ones which surround the Fullerton Hotel symbolise the Wood element. It is common practise in Singapore to use the appropriate number of flags to remedy or diminish any negative energy (sha qi) which may be coming from other buildings. 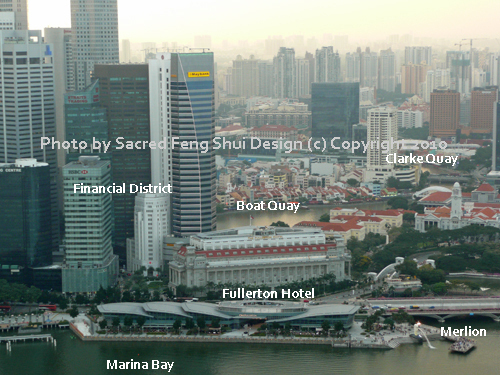 If you look at the photo below, you will notice the Fullerton Hotel has six flags over the entrance. Six represents the Metal element and defends the Hotel from energetic attack by the surrounding tall buildings. Notice the six flags symbolising the metal element on top of the awning? They defend the Hotel from sha qi or the negative impact of tall buildings (representing the wood element) directly in front of the main entrance. Have you also noticed the large white pots? White also represents the metal element. Could the Water Star at the front need the metal element? There is lots of interesting feng shui elements here to investigate. For students of feng shui, you will find the Flying Star Chart of this building very interesting, so make sure you visit the Fullerton Hotel. 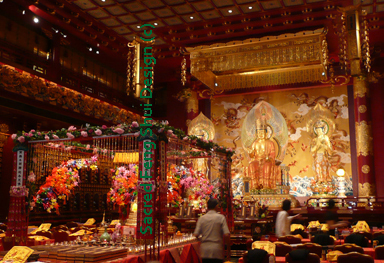 When you get tired of the shopping centres, bright lights and crowds in Singapore, head to Buddha Tooth Relic Temple and Museum in Chinatown. This wonderful temple holds regular chanting and blessing ceremonies conducted by the Buddhist Monks. On the roof is a large prayer wheel which you can spin to release your wishes, and a lovely quiet garden for meditation. The 4th floor is where the Sacred Buddha Tooth Relic is housed in a beautiful golden stupa. 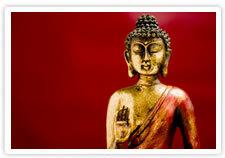 An impressive selection of Buddhist artefacts is housed on the 3rd floor. Pop into the 2nd floor for a cup of tea and light vegetarian food at the Lotus Heart Teahouse before you browse the wonderful books and souvenirs in the Buddhist Cultural Shop on the same level. The easiest way to get there is to take the MRT and get off at the Chinatown stop, then it's a 5 min walk to the Temple. Located near Bugis Street MRT Station, allow a few hours to visit the Fu Lou Shou Centre and surrounding markets. This centre is named after the Gods of Good Fortune (fu), Prosperity (lu) and Longevity (shou) clearly identifying its speciality. Take a good look through all four floors before you make a purchase, as prices vary and bargaining is a must. It's also a great place to get your hair done or have a massage at bargain prices. I had a yummy vegetarian lunch at Nature's Harvest Cafe, a friendly family owned vegetarian cafe and mini market on the 2nd floor. Ok, enough sightseeing tips ... lets get back to feng shui! The Grand Hyatt Singapore has a very uninspiring facade, but don't let that fool you! The interior of this Hotel is a stunning showcase of classic, contemporary and stylish designs using the five elements of fire, earth, metal, water and wood. Even if you know nothing about the relevance of the five element theory in Feng Shui, you will appreciate the lovely design and energy of this five star hotel. 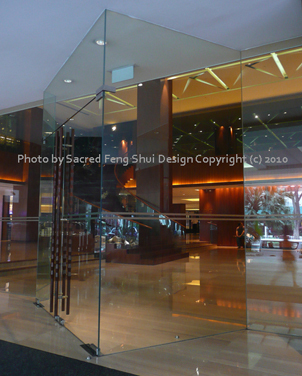 The Grand Hyatt has become quite a feng shui legend in Singapore due to its angled entry doors and the fact a well loved and respected Buddhist Monk, Grand Master Hong Choon, was the feng shui master who suggested the various changes to the Hotel. Born in 1907 in China, he became a monk at 16. During World War II he fled to Singapore and then spent some time in Penang where he learnt feng shui. In 1947 he was asked by the Chinese Buddhist Association to lead Phor Kark See Temple at Bright Hill. Under his leadership, he progressively developed and expanded the monastery and his followers into the largest Buddhist place of practice outside China. He passed away in 1990 aged 83. Venerable Hong Choon was so loved and revered by the local Chinese Buddhists, there is a Museum dedicated to him at Kong Meng San, Phor Kark See Monastery (Kmspks). Although he consulted for many years, Grand Master Hong Choon eventually stopped giving feng shui advice due to his Buddhist beliefs. According to Grand Master Lillian Too, because Venerable Hong Choon felt he was instrumental in helping a man involved in the fishing industry become very successful through feng shui, thus causing the death of billions of fish, he stopped giving feng shui advice. A truly sad loss for feng shui, but a wonderful example of his beautiful soul! There has been much speculation as to the formula used, and the reason why the glass entry doors are at a different angle to the building. However, if you learn feng shui from Grand Master Raymond Lo as I have, or read his book 'Feng Shui Essentials', he explains the method - a door chart. In the case of the Hyatt built in Age 6 NW1, Water Star 8 at the entrance of the building was considered distant wealth in the Age of 6 (1964-1983). He looked at the Flying Star Chart for the Age 6 N1 which had Water Star 6 at the entrance, so the door was tilted 45 degrees to allow the prosperous energy of the current Noble to flow in the entrance. Of course, the 6 Water star of the door chart in Age 7 (1984-2003) is considered fading fortune, and since 2004 we have moved into the Age of 8. Why wasn't the feng shui of the Hotel changed to keep up with the change of Ages and fortunes? Perhaps the Hyatt management had such respect for the Venerable Hong Choon, they did not want to change any aspect of his feng shui? However, during extensive renovations around 2005, the angle of the glass doors was changed again, even though Water Star 8 is at the entrance. Unfortunately I did not have my compass with me so I could not take the door reading, thus the reason remains unknown. But when I visit Singapore again I will update this newsletter. I compared my recent photo of the doors to a photo I took some years ago. Not only has the door angle changed, but also the door handles. 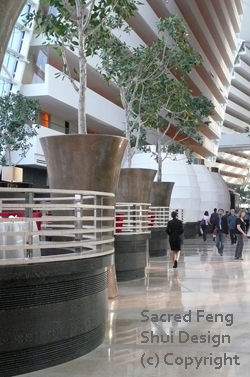 If you look at the Hyatt website, they still have the old photo of the entry doors. The handles used to be gold and ran horizontally across the doors, and now they are made of wood, and run vertically. As the door chart had a 6 Water Star at the entrance, it made perfect sense to have gold door handles. The building's Flying Star Chart has a Water Star 8 at the entrance indicating prosperity for the Hotel during the current Age of 8 (2004 - 2024). As wood controls or attacks earth, wood will stimulate the 8 Water Star. Why did the current feng shui consultant advise the Hotel to angle the doors further when an 8 Water Star (very prosperous during Age of 8; 2004-2023) is at the entrance of the building chart? I had a look at the NW2 door chart and the feng shui is not fortunate for the current Age of 8. Perhaps the Hotel has enjoyed good publicity from the unusual doors and didn't want to go back to straight 'normal' doors. I am sure all will be revealed with a compass reading. I will leave the mystery for feng shui enthusiasts to solve until I get back to Singapore myself! I hope you enjoyed my Feng Shui Tour of Singapore. Of course, there are many other great feng shui buildings I saw and photographed in Singapore, but I decided to omit them to keep this newsletter short and interesting. That is another reason why I have not talked about the Flying Star Charts of the Marina Bay Sands and The Fullerton Hotel. Singapore is a wonderful city, it's so easy to get around. 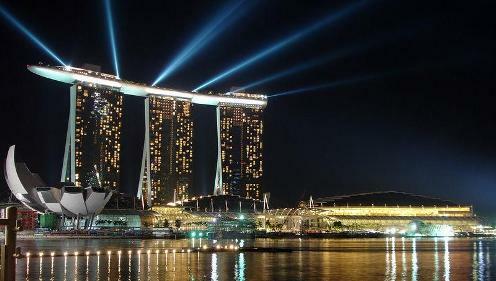 Singapura (the Lion City) rarely sleeps, so do some sight seeing during the day, and shop at night. There are so many restaurants and cafes, the hardest part is working out which one to try first. Until my next visit to Singapore, if you have any questions, please feel free to Contact Me. 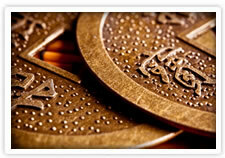 For information about my Feng Shui Services click on the link provided. (Note: Please view this newsletter in your Internet Explorer browser as Firefox plays havoc with the format).